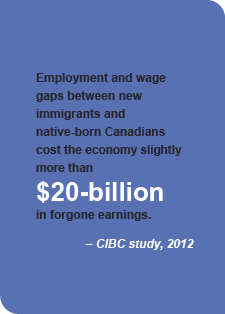 Labour shortage or skills mismatch – economists might not agree on exactly why companies are struggling to build the workforce they need to thrive, but they do agree on one solution: helping Ottawa employers to make the most of the rich pool of immigrant talent in their own back yard. 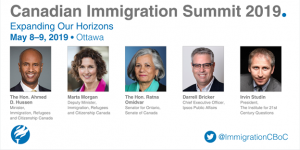 That was one of the key messages coming out of Hire Immigrants Ottawa’s annual Employer’s Summit, held March 3 and 4, 2015 at the National Arts Centre. This year’s theme Skills to Jobs: Ottawa’s Human Capital Requirements in the Knowledge Economy, brought more than 200 leaders from business, government and politics to talk about the effective integration of immigrants into the capital’s work force. Two keynote speakers provided the audience with different perspectives on Ottawa’s labour market and the wider national context of immigrant employment. Dr. Rick Miner, management consultant, former president of Seneca College and author of The Great Canadian Skills Mismatch: People Without Jobs, Jobs Without People and MORE spoke on the first day, while Don Drummond, former chief economist for TD Bank Financial Group, now visiting scholar in Global Public Policy at Queen’s University, appeared on day two. In between, panels representing the depth and diversity of Ottawa’s knowledge economy – including IT companies, human resources agencies, sector councils, the Chamber of Commerce, the City of Ottawa and settlement agencies working with skilled newcomers – tackled the practical challenges of connecting employers with the right applicants and moving beyond attracting to retaining top talent. 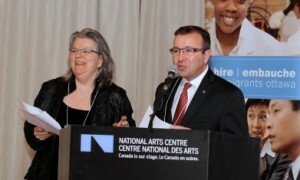 The co-chairs of HIO’s Employer Council of Champions, Gaye Moffett, Founder of GEM Healthcare, and Frank Bilodeau, Vice President of Scotiabank for Ottawa and West Quebec, welcomed participants and highlighted HIO’s success in helping more than 1,600 immigrants find work relevant to their skills. The Hon. Michael Chan, Ontario Minister of Citizenship, Immigration and International Trade, shared some of his own history as a young immigrant working in the basement of a restaurant, and spoke of the competitive edge to be gained from hiring immigrants. Ottawa’s knowledge economy demands high skills: 71% of all jobs in the capital call for post-secondary education – the highest among Canada’s metro areas. We also have one of the highest-educated workforces in the country, including some 97,000 immigrants with post-secondary credentials, many with sought-after STEM and health-sciences training. 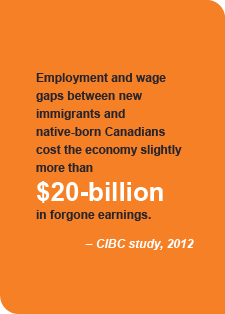 Yet employers continue to identify ‘access to skills’ as the top barrier to doing business in Ottawa. So why the disconnect? Dr. Miner walked participants through his own research into Canada’s labour market challenges, concluding that skills mismatches persist in several areas. Beyond the shortages in specific categories (such as not enough tradespeople to meet the demands of a building boom), Dr. Miner believes there is a geographical gap, with some regions desperate for the skills that are going unused in other regions. He also sees an underemployment problem, in which too many people are working jobs that do not use their skills or training. 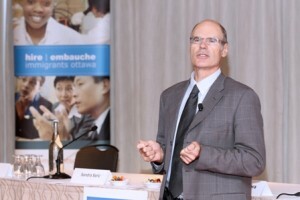 The following day, Don Drummond assessed what he saw as immigration policy challenges and flawed or limited labour market information. He then reminded employers that they didn’t need to wait for someone else to straighten things out. Employers make a significant difference at ground level simply by reframing their employment practices, Drummond said. Drawing on his own experience working with newcomers at the TD Bank, he urged hiring managers to look beyond the credentials that don’t seem familiar or the language skills that aren’t perfect, to see the other assets newcomer applicants have to offer, including global networks, innovative thinking and diverse perspectives. 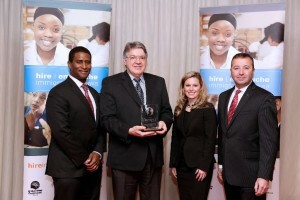 The summit wrapped up with the presentation of the annual Employer Excellence Awards, recognizing Ottawa employers who have demonstrated outstanding practices in recruiting and retaining newcomer talent. This year’s recipients included the Business Development Bank of Canada, Epocal, the Ottawa Catholic School Board and Pinecrest-Queensway Community Health Centre.